Looks so good. Love that it is so easy to put it up. Just toss it together and bake. Will make this, have some haloumi in the fridge begging to be used. Thanks Sunita, it is wonderful how quick & speedy this one is. Wow, love this simple meal! I have not tried haloumi before, have not seen it in the area where I live. This is the kinda of meal that is satisfying without much effort in preparation, my kinda dish! Thanks Joyce 😊 Oh you should try haloumi…it is just delicious fried or roasted. This looks good, sounds nice, and tastes better. Another must-do dish. I have to go to the supermarket to check whether haloumi is available there. Any haloumi substituion? This sounds like a great combination of flavours, especially the salty halloumi with honey chicken. It's a bonus that it's so easy to make. Okay, this might, just might be the winner this week in my book..this looks fantastic and marking it to fill in this week for a day I hadn't had a clue what I was planning. Wonderful photo. Thanks Julie, so simple I challenge just about anyone to not be able to make this! This dish looks like a real winner, Mairi - I can see me making this before the week's over. Love anything that's so quick and easy to put together, and especially anything with haloumi - don't know why I've never thought of roasting it before. I really can't figure out how DH can turn such simple things into stunning dishes that are both quick and easy. If I had a source for haloumi, I'd make this tonight! 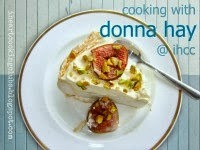 I also turned to Donna Hay for potluck week because I really needed simple, quick, and delicious. I really love how she writes so many simple recipes that are actually inspiring. This one is no exception! It looks beautiful and I really love all the flavors here. Thanks Kim, I know loinvg all this Donna Hay as can get home whip up supper so quickly! I had to look up haloumi.. Now that I know it is cheese I will have to look for it - and make this. Such a lovely, simple dish! You can always count on Donna Hay for inspiration. Your photos are beautiful!